Fresno Fun Jump offers gift certificates in any amount. 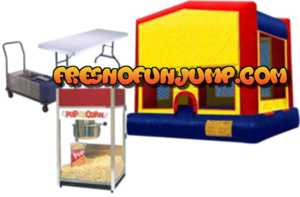 Browse through our website to find inflatables like our Giant Slides, 5 in 1 Combos, Bounce Houses, Interactive Games, Bungee Run, Snack Machines and more. Add up the total cost of the items you think would make a great gift package. Then give us a call to order your gift certificate.